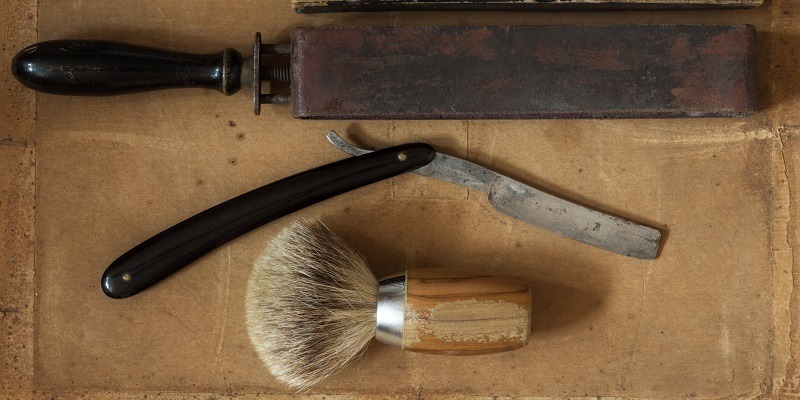 If you’ve made the decision to ditch your safety razors and venture into straight razor shaving, you’re going to need to know how to sharpen a straight razor. Now, honing a razor isn’t rocket surgery, but it does require a bit of practice. If you’re a newbie, all you really need is a new razor and a strop. You won’t have to worry about sharpening for at least a couple months. Plus, you should learn how to properly strop a razor before you learn how to hone one (in fact, some lads we know don’t even use a hone; they use a strop exclusively). However, after a couple of months, you’ll want to sharpen up your razor. If you’ve been using a strop, you’ll probably only need a good polishing hone. But a sharp razor is a safe razor, so it’s important to keep a good edge on your blade. Does your razor even need to be sharpened? It’s an important question. You need to be able to recognize exactly how un-sharp your blade is before you even start – as well as what grit you need to restore its edge. Most of the time, you’ll be able to tell if your razor needs a hone as you use it more and become familiar with how it shaves. However, there are a couple of “tests” you can conduct to see how sharp your razor is. Test 1: Shave. This is a no-brainer. Just give yourself a shave. You’re looking for things like comfort, closeness, hair-pulling and irritation. If your razor pulls on your hair, it’s probably a little dull. If it skips right over the hair or irritates your skin, it’s probably a bit too sharp. Test 2: Single hair cutting. Grit your teeth, and pluck a single healthy hair out of your head. Try not to scream. Hold the razor still in your shaving hand. Hold the hair in your other hand by its root. Bring the hair onto the razor. Do not cut or swipe with the razor. The razor stays still here. If your razor is sharp, it will cut the hair, and the hair will fall away cleanly. If it catches or tears, it’s probably time to hone. Test 3: Thumbprint. Wet your thumb and draw it across (not along!) the edge of your razor. You’re looking for how the blade catches your fingerprint. If it produces a slight tickle, it’s probably just right. If it produces a stronger tickle and basically feels like a kitchen knife, it’s probably not sharp enough. Test 4: Fingernail. Draw your razor over the top of a wet fingernail (usually your thumb). Ideally, the blade will pass over the nail and cut in just slightly. If it glides over it like ice, however, it’s probably too dull. There are lots of different hones, but we do have a favorite. We really prefer the Norton 24336 Japanese-Style Combination Waterstone. This is a 4000/8000 combination grit, which we find just right for most razors. It comes in a blue plastic box that doubles as a stand, so you can put the stone on top of the brackets in the box, and it’s generally all you need. The box also acts a reservoir, keeping the stone wet between uses. The combination grit makes this hone uniquely useful for sharpening razors at many different levels of sharpness. One of our favorite things about this stone, however, is the size. This is a 3-inch stone. Many sharpening stones are 1 inch wide, which means the stone can never be in contact with the whole length of the razor blade at once. This makes it very easy to end up with inconsistencies, nicks and chips. With a 3-inch stone, you can more or less sharpen the whole blade at once. There are tons of hones out there, but we highly recommend this one. It’s a great all-purpose stone. Place your razor flat on the stone. Most razors today are hollow-ground razors. This basically means that each side of the razor is ground into a concave shape, which gives the razor a much finer edge. So, when you lay it flat on the stone, it will be at an angle (since the spine is thicker than the edge). This angle was determined by the manufacturer and is generally a good guideline for sharpening. Additionally, laying the razor flat produces a consistent bevel, and consistency is very important in straight razor sharpening. Use an “X” pattern. With the razor flat, guide it evenly along the stone. Lead slightly with the heel of the blade. Your blade should make an “X” pattern on the stone. So, on each pass, drag the blade slightly downward. This kind of stroke helps to avoid catching your razor on the edge of the stone. If you want to add a bit more protection for yourself, you can bevel the edges of your stone, which will greatly reduce the chance of damaging your blade. Use slow, light strokes. Using lighter strokes will sharpen the razor all the way to the edge. The more pressure you add, the great chance you have of missing the head of the bevel. Sharpening a straight razor is not something to rush. Think “quality,” not necessarily quantity. Don’t over-sharpen. Over-sharpening with give you an equally uncomfortable shave as under-sharpening. Super-sharp straight razors can give you big time razor burn, so don’t overdo it. For some more advanced sharpening tips, check out this great video from Plexuss.